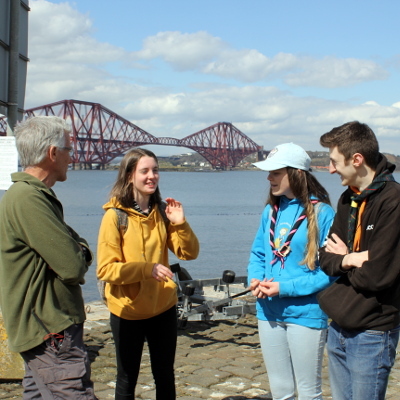 How do we get more Young People interested in doing activities? After meeting Ian on possibly the hottest day of the year so far, we had a good look around to see what Longcraig had on offer. It has a lot to offer, we discovered. 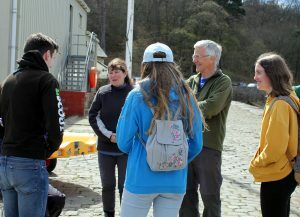 Once the formal tour was over there was a chance for us to get to know the people at Longcraig, and conveniently for us there were four young people taking part in sailing training after helping out at Longcraig. They talked about how rewarding it was to work so hard over the winter repairing boats and then to learn how to sail one, most of them never having been in a boat on their own before! Then came the Golden Question “Do you want a ride in the power boat?”, to which the reply was a fast and definitive “YES!”. Off we went to get our buoyancy aids (safety first) and had an amazing tour of the Forth Rail Bridge. We left with lots of thoughts on how we can help get more young people involved, but our first and most obvious point is just telling them. So, if you have young people who are interested in a new challenge on or off the water, then get in touch.